As an American living abroad I am resisting the impulse to be filled with anxiety today. Instead I am focusing on work and checking of a number of tasks during the day so I can go to bed early tonight and miss the endless nail biting speculation. My Etsy store reopening is delayed until I get prints sorted. In the meantime I will be offering original artworks up on Instagram at super reasonable prices. They would make fabulous gifts and the sale of them would help me purchase a new printer and scanner. Over on Instagram I am hosting a little art postcard giveaway. So if that sounds like something interesting to you head on over there. Essentialism in illustration is pretty powerful. I was working on some slow and detailed watercolor illustrations of hats when my five year old wandered over and pointed to the beret and said Paris! She then called out the witches hat, the winter hat and the police hat. I abandoned that watercolor painting (for now) and went in this direction instead. It's a sickness I allow as long as it doesn't get in the way of creativity. Now that I have a better idea what I like I have put some severe limits on what I add and am starting to put away, sell and gift what I am not using. Mostly I just focus on drawing and painting every day. As much as I strive for minimalism I often fall short, especially when it comes to art and stationary supplies. This little box I got in London when I first moved to the UK and was waiting for my supplies to arrive from Boston via boat shipment. Now it is a contained collection of everything I need to get to art making. Usually in the living room while I watch TV with my husband in the evening. What is your shopping weakness if you have one? 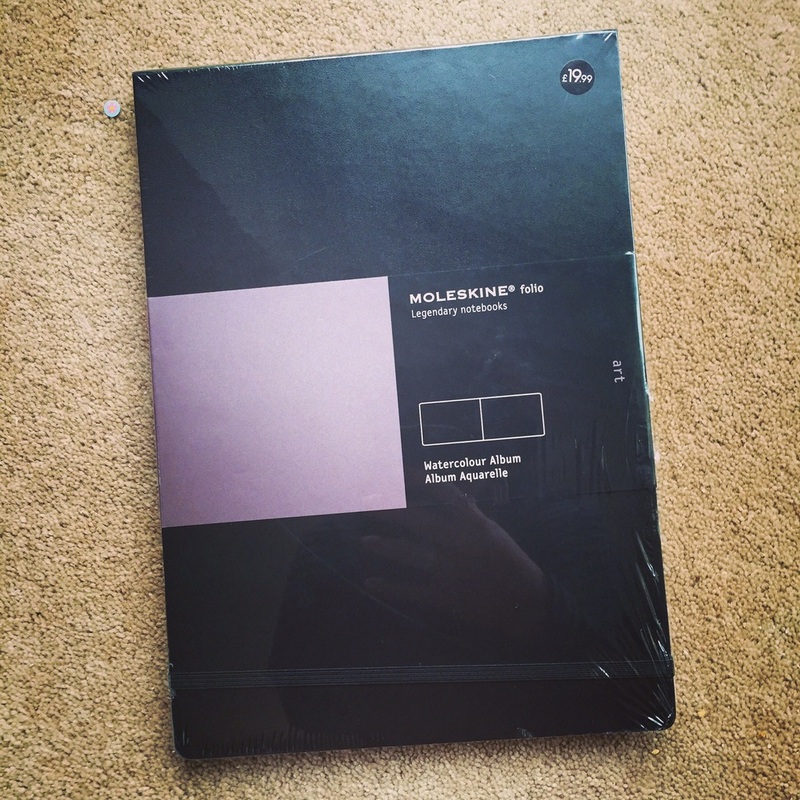 When your current daily inspiration is a 60p gridded A6 notebook from Muji. I love nice paper and beautifully bound books that collect precious sketches. I even made a point to back the latest edition of the Perfect Sketchbook with it's lovely leather hardbound body filled with the finest Italian watercolor paper. But that won't be arriving for some months! In the meantime I have been finding myself getting too precious about my Moleskine watercolor sketchbook and as a result my work suffers. Time to spend some quality time with a cheap sketchbook and get back to obsessive low pressure sketching and what caused me to start drawing again in the first place. Thin (but surprisingly sturdy) paper. Not precious. Loving it. Since summer I have been having a love affair with my Midori Travelers notebook. Scribbling away in it, taking notes, journaling, sketching and even painting. It all fits in the books that I have bound with elastic into a sturdy leather flap. It certainly helps that the Midori paper is so great with fountain pens and even watercolor. My sketchbooks change all the time and often get left behind on busy days, but my traveler's notebook comes everywhere with me. Do you have a notebook that you carry with you everywhere? 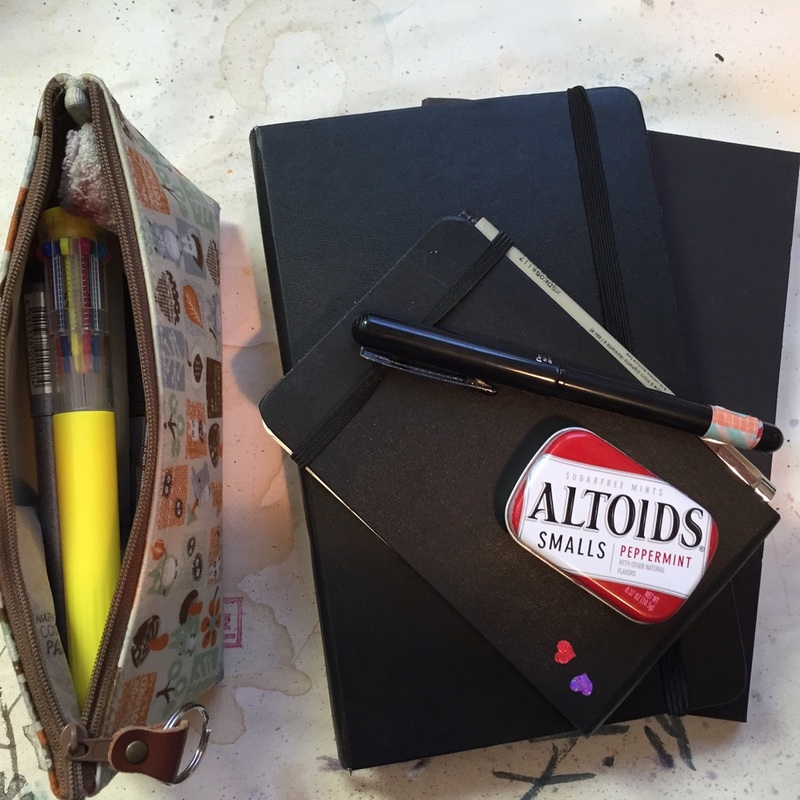 I would love to hear what other people are doing with their Midori Traveler's Notebooks and sketchbooks. Two weeks into working with this new sketchbook for the month long drawing challenge #inktober and I am making the best of it. This sketchbook has a lot to love, but ultimately for me there is more to hate than to love. I love the size and the binding. I got the medium A5 that is enough space for working yet remains very portable. It opens up nice and flat and isn't too thick like other sketchbooks. And it is portrait rather than landscape which is great. But this is not paper suitable for watercolor. Another problem I have is that most pens feather and leave a fuzzy line on the page and some even bleed through. In the end I will keep doing my ink sketches in this book knowing the limitations and then avoid these sketchbooks in the future. Not the noxious green melon liquer that I drank in college! But a beautiful and simple leather folio that holds various notebooks. I wanted one and got one for Christmas. But it wasn't love at first but it has grown on me this summer as the item I carry with me everywhere and put my life into. Why wasn't it love at first? 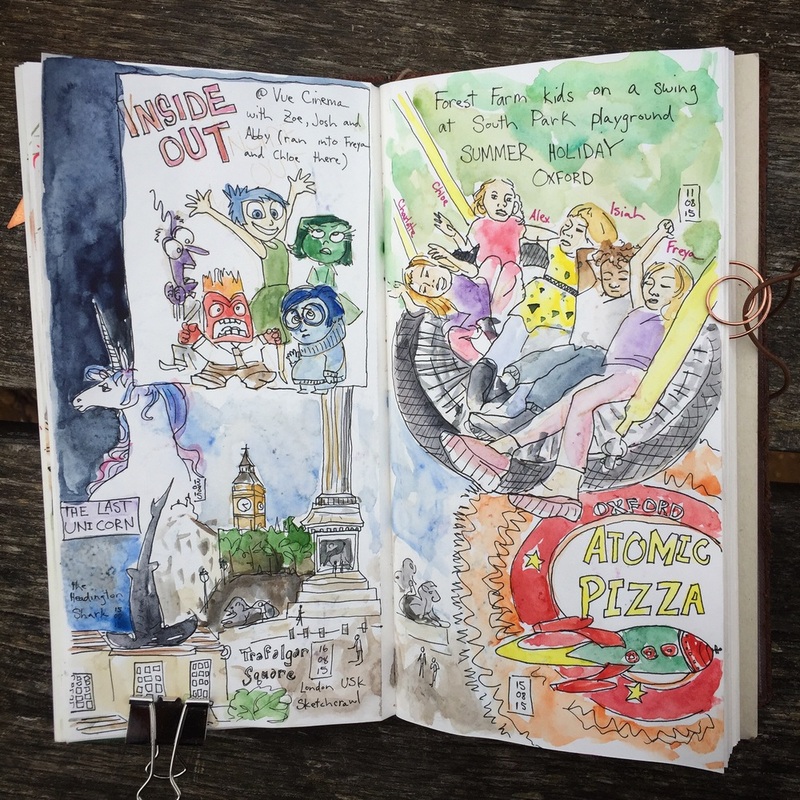 Because for urban sketching I prefer a proper bound usually hardback sketchbook. 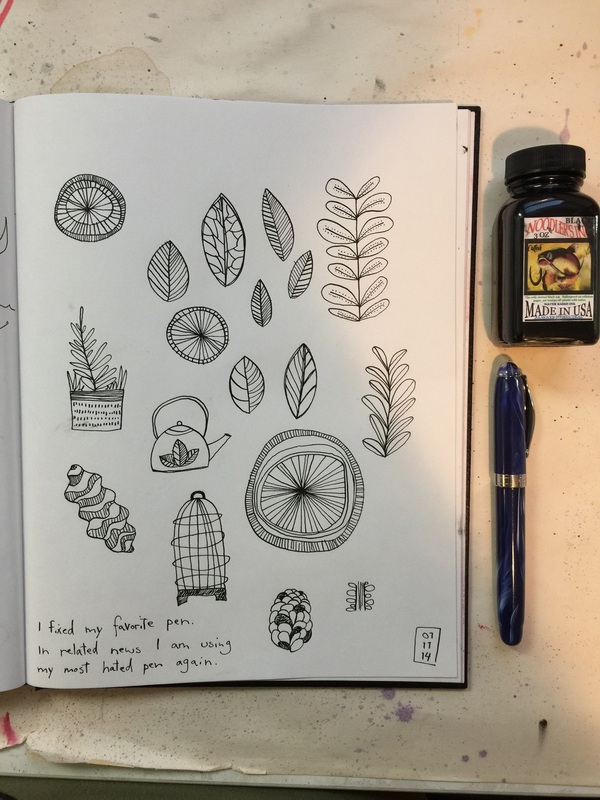 Summer has not contained much time for urban sketching but there has been more than enough time for Sketchnoting, journaling, reflection and planning. The Midori has been well used and perfect. I am a bit of a collector and a tinkerer. My collection of watercolor palettes has led me to some tinkering. Yesterday after scrambling to grab my painting supplies so I could paint in the dining room with my kids I decided to hack up a neglected palette into something more workable for that task. First I removed the rather heavy metal insert that holds the pans of paint inside and instead used blue tac to place 22 half pans in my favorite most versatile colors inside. That left room for a couple of brushes, a water brush and a pencil. Put one of my wrist cuffs sock rags at the bottom and the brush tips are protected. Kit complete? Not until I removed the mostly annoying flap from the bottom. Meet my new and improved palette! I love it! The boat shipment filled with the bulk of my art supplies that is taking it's sweet time getting to the UK. It didn't even leave Boston until two weeks after we left the country and isn't due until later this week, then it needs to clear customs. I am regretting some of my air shipment decisions. I wish I had included more art supplies. Especially watercolor sketchbooks and tubes of paint. I'm comepletly out of thick tough watercolor sketchbook pages and have been on a roll with the watercolor sketching. Today I went looking for an affordable option to tide me over while I wait and I found nothing but an old stock Moleskine watercolor sketchbook. Of course I bought it immediately since the old paper is supposed to be a lot better. But this is a very nice book and not inexpensive. No doodles for it! It might come with me to Paris or Rome though! I've been making small art cards as a way to help generate and try out new ideas for many years now. I have a collection of artist trading cards that I traded for, some that I purchased and I have sold many of my own. These days I am coming up with creative ways to give them to people that I meet. Seems like moving to a new country is a great chance to start giving out little tastes of art while practicing my skills in small low commitment ways. Brilliant Idea. Genius. Binder Clips. I love my watercolor brushes and treating them well is important to me. Treating them right so they give me their best for years to come. But my space is small and I would rather spend my hard earned money on paint and brushes rather than fancy brush storage. I like to keep my most used supplies as close as possible. Enter the binder clip. Low tech yet they pretty perfect for all sorts of jobs, including good brush storage. Product Feature - The Waterbrush! I love these things! They make painting in a sketchbook on the go so much easier. They hold a fair amount of water, are small, durable and most importantly they don't leak so they are portable. I also like giving them to my children when they paint so we don't have to worry about mess too much. I do worry about my youngest turning every set of watercolors I give her purple but that is a different issue. Nothing will top a quality brush and a cup of clean water but having a waterbrush or two around has often meant the difference between me being able to get a sketch done or not. Good news! 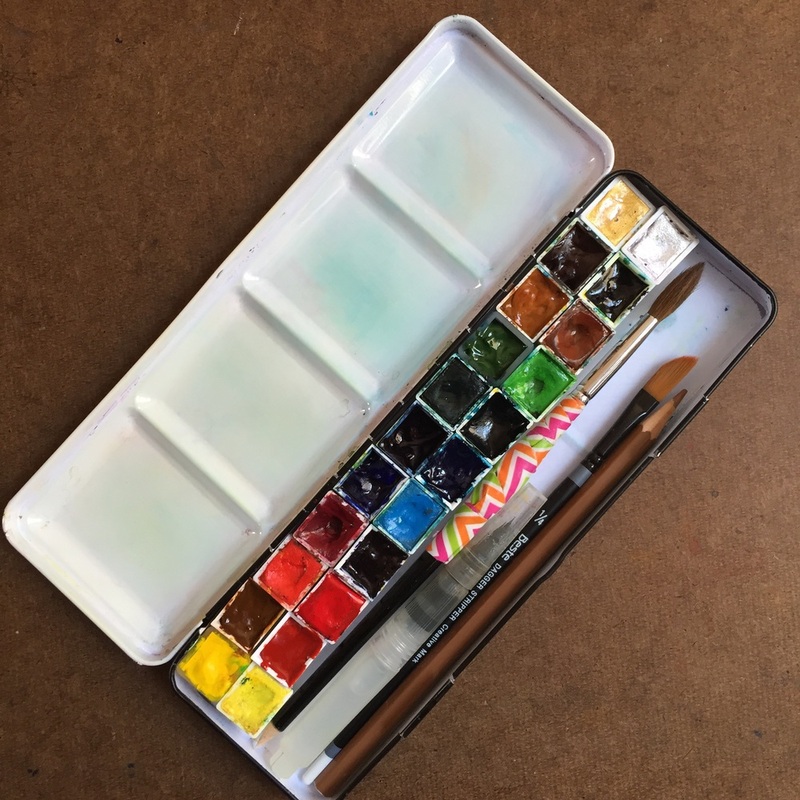 I've started selling my mini Altoid watercolor paint kits on Etsy. For a limited time as a special bonus I am offering a free watercolor painted card with the first one purchased on Etsy. 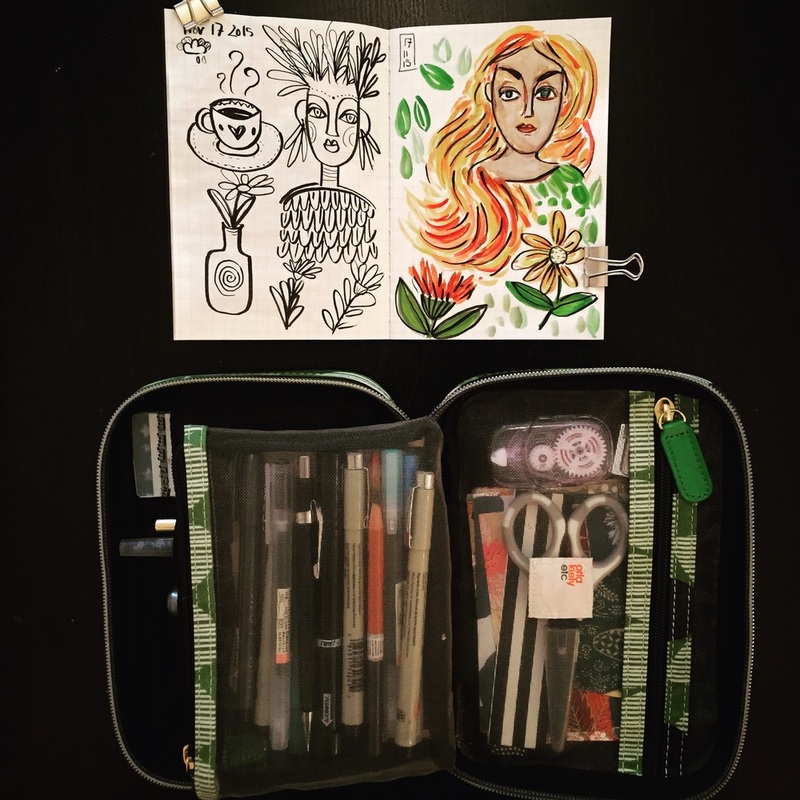 I have collected a lot of commercial tins during my watercolor painting adventures, but I always come back to this one for on the go come with me everywhere color. Vegans look away! A few months ago I discovered the joy that is painting with a squirrel mop. They can be expensive but the Harmony brand is great and so affordable it doesn't need to last as long as Da Vinci or Isabey. What I dislike about squirrel is the fragility of the hairs and they lack of snap. On a whim I picked up a size six Silver Black Velvet brush not knowing what to expect from a squirrel synthetic combination. It got great reviews and was on sale at a great price. Love at first stroke. It keeps the best point of any brush I own, feels great in my hand and is more rugged than a pure squirrel hair brush. I now have added a size 10 round with a few more shapes heading my way. I can get a full set of brushes for the price of a single Kolinsky brush! And they now make travel brushes! I'm in trouble! My paint pallet, brushes, ink and pen collection has exploded recently. They bring me joy to use and I do indeed use them. Experimenting with a new color or brush is always fun, but can I master them if I am constantly trying something new? Paint more. This is a weird pen. But $20 for a flex pen with a converter for taking bottled ink I figured it was worth a shot. I got it months ago from Amazon before I had heard of the Goulet Pen Company. If I get another one I will be ordering from Goulet in the future. My pen arrived and the ink flow was too much, too wet and it smeared all over the place. I adjusted the pen and got ink all over the place but the pen worked better when I was done. Then I decided it could be better after watching some videos and reading some pen adjusting tutorials and adjusted it again. Another mess and in the end my pen functioned worse than it did new out of box. I was frustrated and I put the pen aside and started using my Lamy Joy and enjoying how that pen just works without adjustment. But after a few months I really started to miss that flexible line quality that I can get with the Ahab and nothing else. So I rubbed some Gloves in a Bottle lotion on my hands and adjusted my pen again. Now I love it again and I am not fussing with it anymore! This pen is not an entry fountain pen for novices. That honor belongs hands down to the Lamy Safari, another affordable fountain pen that works straight out of the box and continues to work for many years. But for people who don't mind getting their hands dirty fiddling with a pen this is a fun pen to try. For me the line quality is such a joy to draw with that it was worth the hassle of learning how to adjust the pen properly.